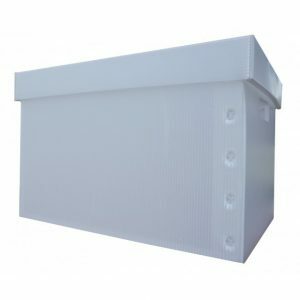 Should I use Polypropylene or Polyethylene plastic corrugated for my container? 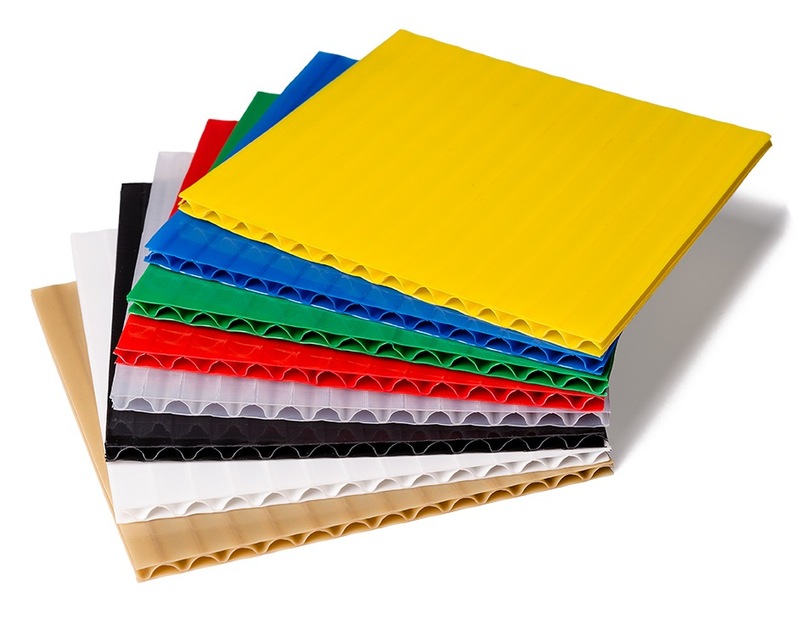 Polypropylene or Polyethylene are the two different types of resin used when producing plastic corrugated. 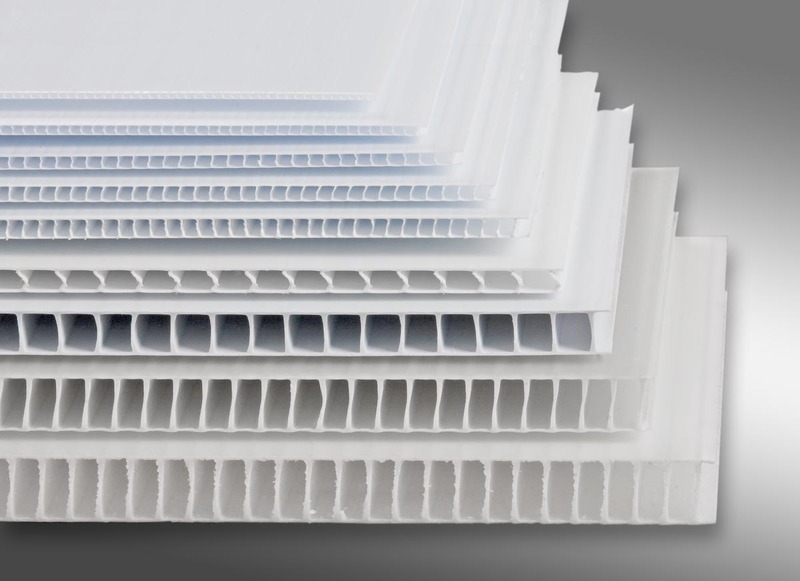 The most common throughout the plastic corrugated industry is polypropylene when producing products or sheets in profile (I-Beam) structure material. The I-Beam plastic corrugated material can also be produced in polyethylene when required. When producing containers or sheets in plastic corrugated laminated (Wave-Beam) structure it will always be made from polyethylene. Laminated (Wave-Beam) is only available in 4mm thickness. Depending on the project and design of your product. There may be a reason to use one type of sheet over the other. Just as well their may be a reason to use polyethylene or polypropylene resin over the other because of the application or environment. If we are just considering the resins one of the key reasons. We would suggest polyethylene is that it is less effected by extreme cold applications. 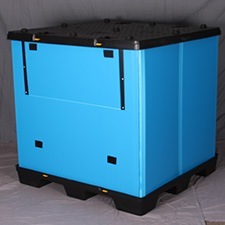 When your container may be exposed to temperatures that reach 50 degrees F or lower polypropylene will begin to have a tendency or at least more likely to fracture or crack when it takes an impact or when flexed or folded in this cold environment. The lower the temperature below 50 degrees the more likely to have these types of issues occurring. Polyethylene is also softer, so it may be selected or rejected for the project because of this factor. The warmer the environment the softer polyethylene will become. One simple way to know if your product is made from polyethylene or polypropylene plastic corrugated is to fold the sheet. If it is any color other than white you will see the fold line turn white where it is stretched around the crease or fold. This will not occur when folding polyethylene plastic corrugated. 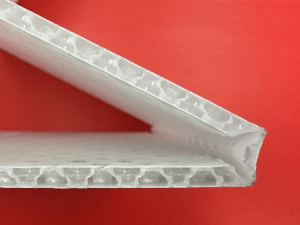 The other comparison when side by side polyethylene plastic corrugated sheet has a “glossier” appearance than polypropylene plastic corrugated sheet. Both materials have their benefits and some deficits. So each project needs to be evaluated for the application and environment. And it will most commonly be used in. Are your online store products available and ready to ship? 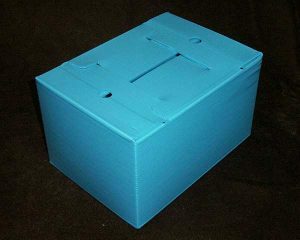 We do have a few plastic corrugated items that are stocked and ready to ship. The majority are available with minimal lead times. With so many products that we offer and with many options like material color choices it is almost impossible to have every scenario in stock. We have the largest online store for plastic corrugated on the internet with over 500 product choices. If we attempted to stock all of these products, we would have to manufacture every product in as many as 8 different colors. Doing the math that would be over 8000 possible plastic corrugated products to manufacture and stock. Inventorying this many products just wouldn’t be practical. Instead we have designed an area of our production facility to handle these standard products in a timely manner and produce smaller quantities than other manufacturers normally would require. In addition to all of these possible size, style and color options some of our customers require their products to be label with their company information on them. So we offer custom printing options on most of the standard products as well. Another benefit to ordering from our Online Store is that will not require you to purchase any tooling to produce the item. Other plastic corrugated manufactures require you to purchase tooling to produce any order.Our standard products have existing tooling in house that we will use to manufacture your order. This saves you hundreds and sometimes thousands of dollars. We also have a selection of plastic corrugated products in our “Quick Ship” program. Allowing for orders as small as 20 containers to be deliver in just 5-7 days. Our other Standard Products ship in most cases in just 2-3 weeks. This allows us to run the plastic corrugated material in the color of your choice. After the material has been process it will be send to our fabrication department. And that turns the raw plastic corrugated sheet in to the finished product that you have ordered. I hope this had shed some light in to the PPS Online Store. And the products we are able to offer you. Question: Can you please explain the different types of Plastic Corrugated? Answer: Yes, there are several variations of plastic corrugated with different configurations and different advantages. The first and most common is Profile Sheet. 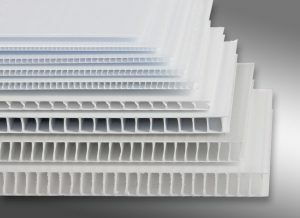 Plastic corrugated profile sheet is available in both polyethylene and polypropylene from 2mm up to 25mm in thickness. It is made by an extrusion process forcing heated resin through a hardened metal die. When the resin is pressed through the die it creates a sheet that has flat surfaces to both sides and an I-beam structure between the two flat surfaces. Profile Sheet is the most diverse to work with since it is available in so many different thicknesses and can be extruded at variable weights. The next sheet type is Laminated Sheet. Plastic corrugated laminated sheet comes is only available in Polyethylene. Laminated sheet is made in a very similar way to paper corrugated fiber. Most commonly made with two flat sheets on each side with a third wave pattern sheet in the middle. Instead of glue being used to attach the sheets together they are brought together while the resin is hot and the layers are melted together. There is another form of laminated sheet called single face. This version only has one flat side and the wave pattern is exposed on the opposite side. Single face laminated sheet can be rolled and is much more pliable than the standard laminated sheet. Available in polypropylene and comes in multiple thicknesses. It has two flat surfaces with either a honeycomb type pattern in the middle or a bubble format in the middle. It has better rigidity in both directions and is incredibly flat on the sides. Although more expensive than the other two options this sheet variation has some performance advantages in particular applications. No matter what combination is best suited for your project corrugated plastic is a perfect replacement when there is an opportunity to reuse the packaging or the packaging or display needs to withstand weather or other variables in the environment. Unlike paper products it is also archive safe and does not contaminate the environment like paper dust making it a great alternative for clean room applications. It can also be customized economically when compared to molded plastic products or thermal formed products. Question: How much longer do plastic corrugated boxes last than paper corrugated boxes? Answer: This will depend on both its usage as well as the environment. In the most common scenarios you can expect the following. You may get longer or shorter usage results depending on the environment, weather and usage or handling situations. 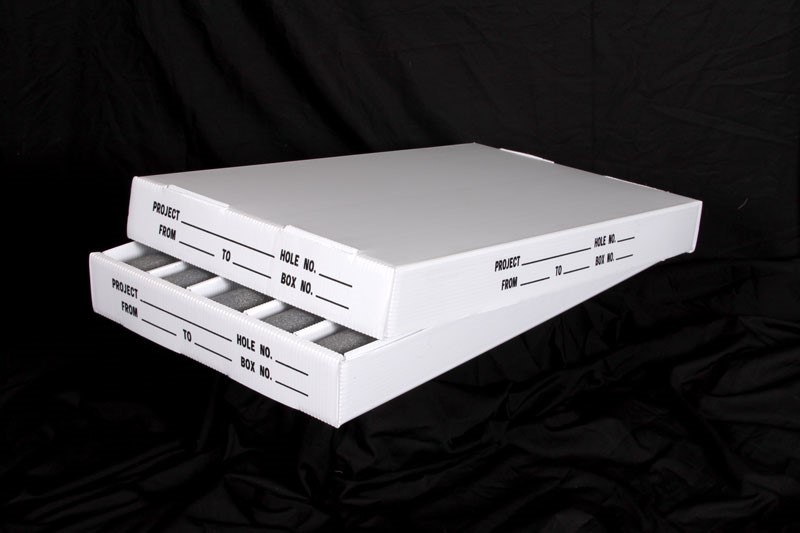 We have seen scenarios where our customers have seen over 100 times the usage of trips that their old paper/fiber boxes had made. There are other cases that saw fewer usages because of the abuse that the boxes or totes take in their system. Some of our customers have had our plastic containers in use after decades of service. 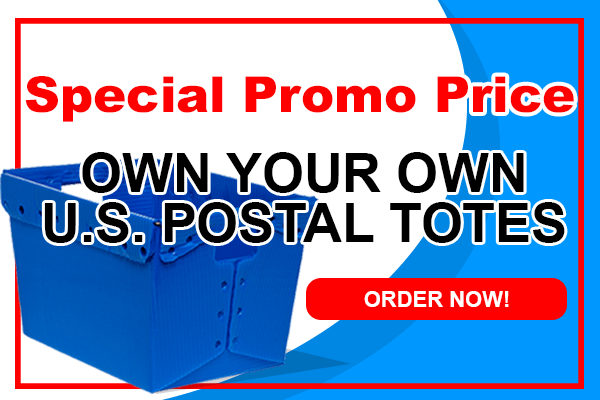 If you are currently getting more than one use from your paper/fiber corrugated box then you are a perfect candidate to switch to plastic corrugated. The most important thing is that you can reuse the container, tote or tray. When using plastic corrugated as a storage unit the material id either polypropylene or polyethylene and is unaffected by moisture and most all chemicals so the life in these circumstances could be indefinite. UV exposure can have an effect on plastics of all kinds. Sun exposure can have adverse effects over time. Even long-term UV lighting can eventually deteriorate plastics although indoor lighting has much less effect than outdoor UV exposure. Even the color of the plastic can determine effects of UV exposure with colors like red being less tolerant to UV lighting. Bottom line when it comes to durability and long-term saving changing over from your fiber corrugated containers to corrugated plastic ones is a smart investment in the long run. 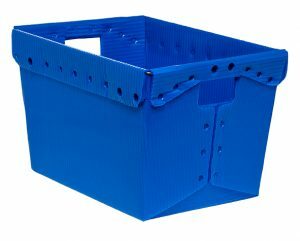 Wal-Mart was using a fiber corrugated distribution box with an average usage of 2 ½ trips per container. 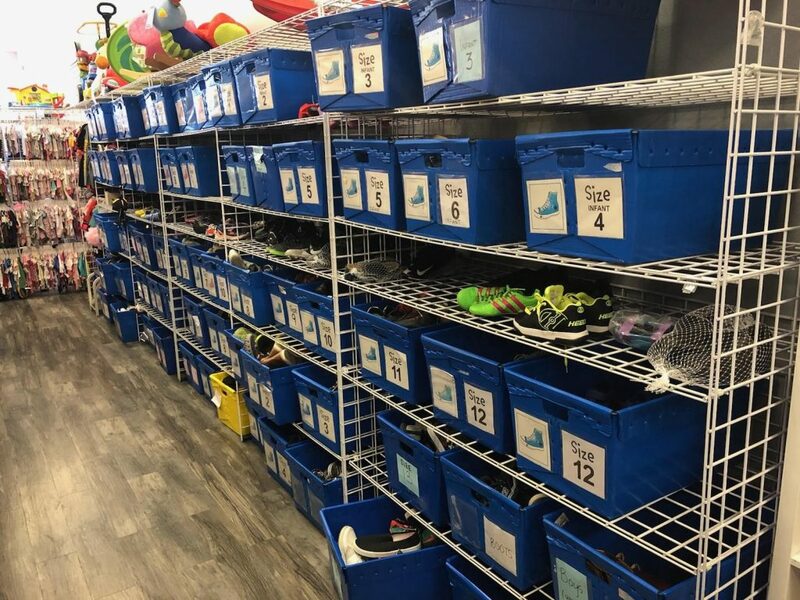 During the initial case study, we had the same container made from our plastic corrugated making over 80 trips in some cases between Distribution Center and Retail Stores. Q) Can I customize one of your recyclers? Any of our recyclers can be customized for your needs. 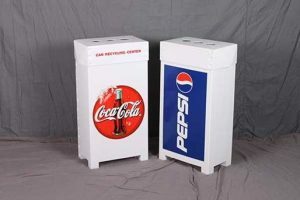 We have standard recyclers available in our online store with various lid combinations at https://plasticpkgsolutions.com/product-category/recycling-bins/ as well as custom variations that may or may not require any tooling at https://plasticpkgsolutions.com/recyclers/. In addition, we can custom design and manufacture a recycler to your exact specifications. 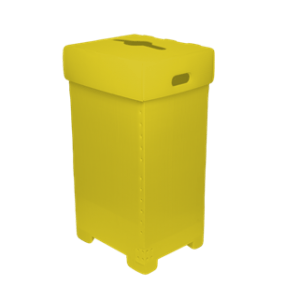 Corrugated Plastic Recyclers are an ideal product as they are very light weight and durable as well as having the ability to ship and store flat to save on your shipping and storage costs. Your options are endless as far as configuration, colors and size. One of the great things about the corrugated plastic recyclers is that it that they are not effected by moisture or chemicals making it your best choice for reusability while still maintaining a very lightweight container. Our recyclers can be used with or without a liner. We can print you unit with whatever message you want to share with your users. It can be as simple as a one color recycle message to a 4-color process advertisement. You can print your message on just the body or add an additional message on the lid. It is also possible to design the lid to be permanently attached the body for applications that may not require needing to remove the lid completely. The options are virtually endless and are dependent on your needs and application for your Recycling Unit.